There are flower arrangers in all three churches. Flower brighten a church and make the space more beautiful for acts of worship. Sometimes the arrangements are themed, sometimes they are bold, striking or symbolic. Contact the Benefice Office below if you would like to join the flower arrangers in St Peter's or St Mildred's. 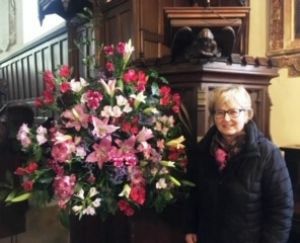 In February 2019, Lynette Coleman won the novices’ cup at the Canterbury Flower Club for one of her arrangements from St Mildred’s Church. St Dunstan's Guild members enjoy using their imagination to create eye-catching displays, especially at harvest time or for weddings. 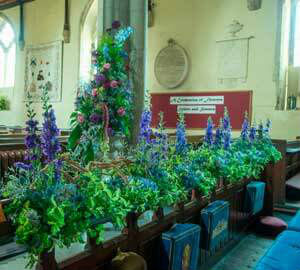 Men and women are members of the Guild and children get involved too in arranging flowers for certain Church Festivals. The flowers are financed by donations from events, such as, weddings or from groups who request flowers for special services. At Easter, contributions are collected for Easter Lilies and from people who value the place of flowers in the church. During Lent and Advent, there are no flowers in church to signify the reflective, spiritual preparation of Christians at that time. The Flower Guild warmly welcomes any new members, whether you are new to the craft or have had previous experience. Email Jayne Ward or use the Contact Us form. Alternatively, telephone the Benefice Office below.